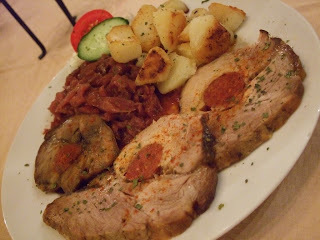 Hungarians are quite keen on stuffed meats, often stuffing them with other meats. Pork and beef are probably their more common choices, with chicken appearing less frequently (and normally with the paprikás sauce, i.e. with sour cream added). 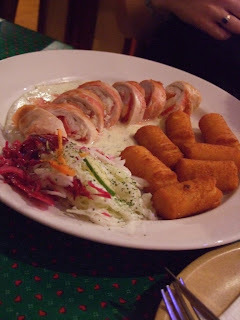 The delightful-looking dish below is from our first night in Budapest. We arrived in Budapest on a Friday, the day after St Stephens Day (and the Red Bull Air Race). The celebration had clearly prompted quite a lengthy celebration, and the majority of eateries in our area were closed, Friday night and all. We had come across an open vegetarian restaurant near our apartment, but its menu consisted mainly of weird things done with cheese, and it didn't quite appeal. Bécsiszelet proved our saviour, however. Here we have pork, stuffed with clod, bacon, feta and olives, in a dill sauce, with a side of crunchy-melty croquettes. We were intrigued by this 'clod' ingredient, and managed to divine that it's something along the lines of speck. It's not just meat the Hungarians enjoy stuffing. They also do a fine line in pancakes. I was in Budapest at the behest of a friend who'd travelled there for a conference and I was able to tag along to the buffet dinner on the conference's last night. 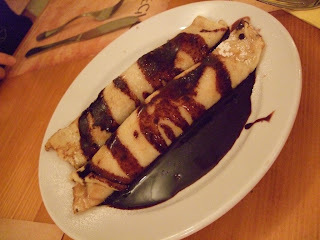 One of the desserts was a bainmarie of palacsinta (pancakes) filled with two types of jam and washed in melted chocolate. At a buffet! 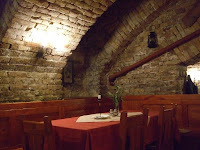 We'd already sampled our own version at the delightful Hunyadivendéglő, appropriately smothered in chocolate and chestnut sauce, accompanied by palinka (fruit brandy).